During the month of March, I have participated in the Slice of Life Challenge, hosted by the community of writers at Two Writing Teachers. Many of my slices are at my personal blog, Just Write, Melanie, but ones that deal specifically with education appear at Two Reflective Teachers. This is an open note of thanks. You have all inspired me throughout the month. You reminded me that our impact, our lasting impact, on students intertwines with how we make those students feel. While I do not remember every comment, I am arriving at April 1st with confidence as a writer and as a thinker because all month, I have basked in the support and positive energy of this community. That feeling will endure. You provided me with writing ideas I would not have thought of. On some days, I wasn't sure what to write, and I found seeds of ideas in your words. I also found wisdom that helped me find my stories, value my voice, and reassert my beliefs about the importance of literacy. You commented on my posts, even when I didn't think they were very interesting or funny or smart. When you wrote that my post made you laugh or cry or think, or that you were going to share my ideas with colleagues, I felt important and energized to write again tomorrow. You confessed your struggles and your fear of putting your writing out their in public. Isn't it scary to put our words out there? Yes, we worry about the typos, spelling, and grammar mistakes, but the ideas and the snippets of our lives are even bigger worries. I felt safe with my writing because of your comments and reactions, because of your honesty and reflections about how you feel the same way. You wrote about and shared incredible teaching practices. I know that I spent way more time reading than writing this month. The students within my reach have reaped the benefits of the collective knowledge of this community about engagement, literacy, and self-efficacy. You made me a better educator, writer, and learner. I am humbled by your intelligence, eloquence, discipline, and commitment to reflection and continuous improvement. I will miss you as part of my daily life, but I will see you on Tuesdays. This month, I have committed to writing every day through the community at Two Writing Teachers. 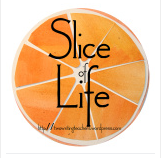 All are welcome to the March Slice of Life Challenge! It's not too late to join in or comment or just read... Many of my posts will be at my personal blog, Just Write, Melanie, but the posts that relate explicitly to learning will be on both blogs. I visited my daughter in college over the weekend, and one of our favorite things to do is to go read picture books at the local Barnes and Noble. Even though she is nineteen, it is a wonderful way to spend time when we need a break from shopping and eating. 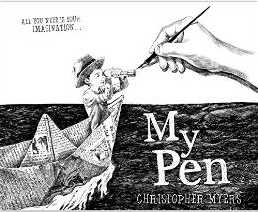 My Pen by Christopher Myers was one of our favorite books we read this morning. The black and white pictures in this book are incredible and would be wonderful in an elementary class to inspire close looking at details. The narrator's pen gives him power, since it creates so many different things. There's not a story in the classical sense, but rather lots of jumping off places for meaningful discussions about our world and the power of imagination. I loved How to Babysit a Grandpa, as it was such a great mentor text for our how-to writing units. Any book that can show students how to write information text with beauty and creativity is high on my list. 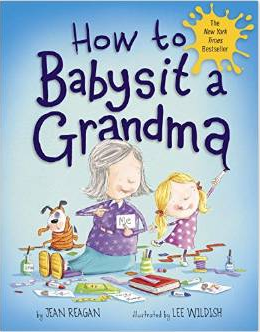 How to Babysit a Grandma by Jean Reagan is just as good! Young students will enjoy the role reversal, and they will identify with the universal experiences of spending time with grandparents, but missing parents. This book could serve not only as a strong mentor text for how-to writing, but also as a way to write about special memories. Doreen Cronin also uses punctuation purposefully throughout the text, which I am also always looking for. 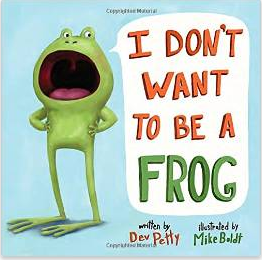 I Don't Want to be a Frog by Dev Petty is a great book to read for the message which is predictably along the lines of appreciating and valuing your own individual strengths. However, since many of our students are in the middle of opinion writing, I have been thinking a lot about reasons and evidence, and this book is a great mentor for talking to students about those tricky words, why and because. 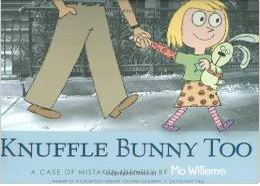 Larkin had never read Knuffle Bunny, and she picked up Knuffle Bunny Too by Mo Willems on her own. It was really fun to read that book through Larkin's artistic lens, as she loved the way the comics were juxtaposed with the realistic images of the city. She also loved the subtle humor, laughing out loud in the middle of the story as she pictured Trixie's parents trying to explain the significance of 2:30 in the morning. Oh, to be able to write a book of such universal appeal! I'm still reading and enjoying lots of great slices at Two Writing Teachers. Tomorrow is the last day of the March Slice of Life Challenge. March Madness Book Edition 2015: Our Sweet Sixteen! This month, my class is participating in our very own March Madness Book Edition! Click here to read posts I have written in the past about the process of selecting books and voting during March Madness. Last week, we narrowed down our 32 books to our Sweet Sixteen! I used Google Forms to create a survey for students to vote for their favorite book in each bracket. To vote, students checked off the box next to the book of their choice in each bracket. Below is a photo of one section of the voting form. When they finished voting, they clicked "submit form" and I received the results. 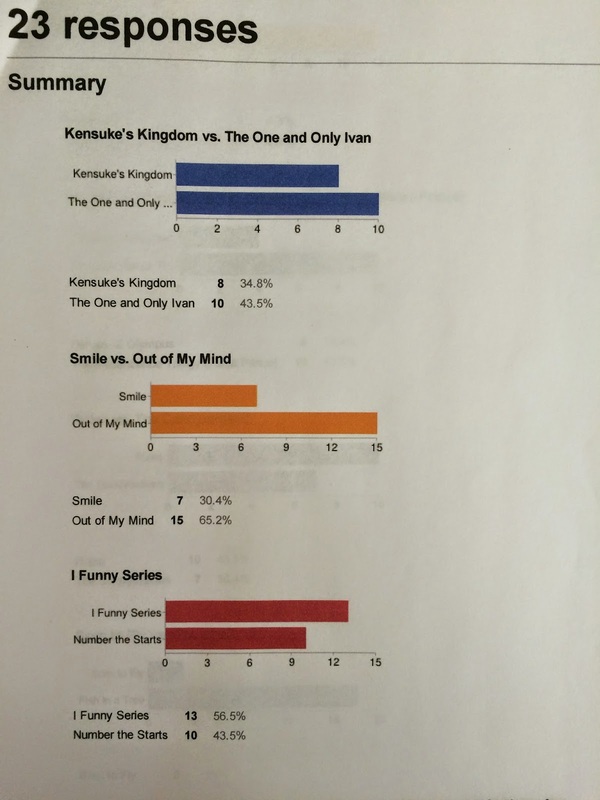 Students were also able to see the results too once they hit the submit button and they loved seeing the bar graphs for each bracket to see if their book was winning! Below is a photo of one page of results that students received on their screen after submitting their form. After reviewing the results and revoting because of two ties, we officially announced the titles in our Sweet Sixteen and added them to our bulletin board. As you can see from the photo below, this is not the most updated because we need to re-vote for two brackets. The Lemonade War series ended up winning by one vote against Theodore Boone series and The Three Ring Rascals series ended up winning by one vote against The Diary of a Wimpy Kid series. This week we will vote to see which titles will move on to the Elite Eight! Stay tuned! For the month of March, I am participating in the Slice of Life Challenge, hosted by the community of writers at Two Writing Teachers. Many of my slices are at my personal blog, Just Write, Melanie, but ones that deal specifically with education appear here. All are welcome to join the slicing party by reading and commenting. People write amazing posts. In the fall, we had a visit from Emily Smith, as Staff Developer from Teachers College. We were working on content area literacy with fifth-grade teachers, and Emily set up centers for students to do inquiry work around topics related to exploration. She created a timeline center, a map center, a close reading center, a compare and contrast center, and a pictures center. I duplicated this work for colonialism, and one of the teachers used the cards that we developed for the unit. Watching the students, it amazed both of us how engaging and how powerful this sort of learning is for upper elementary students. Students had specific tasks at each center. We developed inquiry questions that were open-ended to structure their thinking. For example, when they looked at the paintings from the colonial era, what could they learn about the roles of men and women? What biases existed in the artwork, and how could they tell? Since we had five separate centers, groups of three or four students each spent fifteen minutes at the first three centers, traveling clockwise around the room. Our centers were: statistics and data, maps, timelines, architecture, and art. The conversations that happened during this activity were amazing. 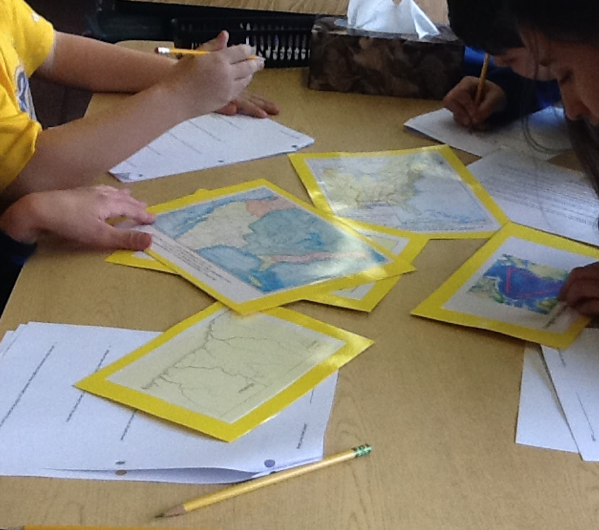 They had maps and timelines that they had to analyze. Their conversations about how the maps related to the timelines were also full of realizations, reflections, and wonderings. Some of them wondered about how the maps looked so different based on only a few years. Then, when they looked at the timelines, they made some realizations about the discoveries and exploration that was happening at the time. 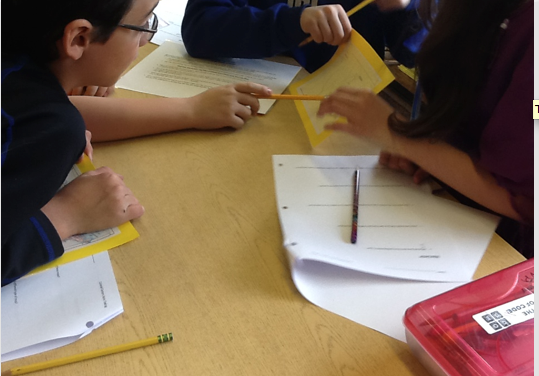 At all of the centers, students took notes based on their conversations and observations. It was fun to watch the different note-taking strategies that they've been learning in the reading units reappear in their social studies work. 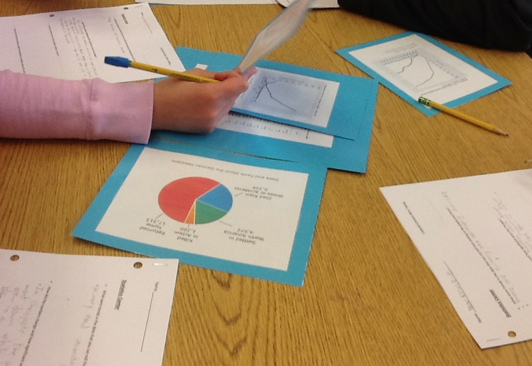 They also had a significant dose of math in that they analyzed data, reading graphs, interpreting tables, and thinking about percentages. Inquiry is such a powerful way to learn. No, the students could not learn everything that there is to learn or even all of the standards around colonialism. However, they asked serious questions and they are inspired to find out more about the answers. Next week, they will finish the first round of centers, and then travel through each center a second time since their understanding deepened as they learned different concepts from each center. I'm looking forward to hearing their reflections and plans for their next round of learning! Help them see themselves as writers. Listen to their ideas, even if their only way of communicating those ideas is with their spoken language. If you believe that they have a story to tell, then they will begin to believe it also. Give them only one or two teaching points at once. With these writers, especially, it is critical to remember to teach the writer and not the writing. No, their writing will not be perfect. Don't let the perfect get in the way of the good. Ask them what they meant to say or what they would say or want they might want to say. Don't tell them what to say. Let their story be their story. Recognize that when they create a super complicated story, it is frequently a costume for not knowing how to tell the story. Help them boil down their epic to a beginning, middle, and end. Less is more. Speaking of end, help the fragile writers recognize and get to the end of a piece. Sometimes writing feels like a brambly pathway with lots of twists and turns and not a single trail-marker in sight. Help these writers know their destination. 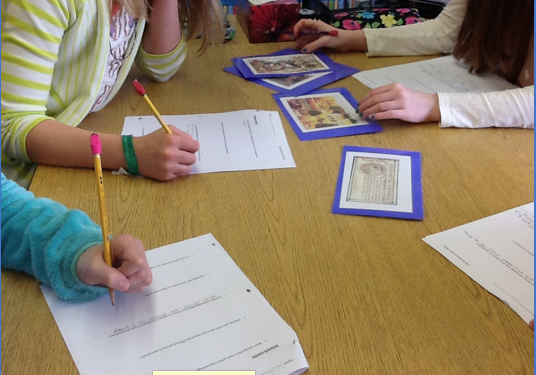 Experienced writers can use their writing in order to discover a story. I have yet to see a fragile writer discover a story by writing and writing and writing. Instead, they get lost and so do we, their teachers, in a complicated story that makes no sense. Did I already say stick to one teaching point? I'm saying it again. And don't let someone else work with them and give them more. As a writer, I can't integrate a bunch of new ideas and I love writing. Fragile writers don't love writing, and it's easy to overwhelm them. Let them experience and enjoy some mastery. Do not write on their writing. Don't do it. Have Post-its on hand. Write conference notes. Accept that you might not be able to know exactly what was on that page tomorrow. That's okay. Make sure that the paper choice matches the writer's capacity. Too many lines are overwhelming. There's nothing like a giant blank paper to freeze every good idea I have. Fragile writers will have more success if they feel like they can fill the lines. Don't give them too many. You will get better writing if you spread it out across pages than if all of the writing is crammed onto one page of more lines than the writer can handle. Recognize the task avoidance signs. The bathroom need, the erasing obsession, the "I can't find my work in progress" syndrome. If these signs are in place, address them and work together to help. Make the work easier for the time being. Writing requires confidence. We build confidence by creating competence. I promise that if you make it easier for a while, you will be able to make it more complex later. This post is longer than I had planned, but took me less time to write than you'd think. Some of these need a lot more elaboration--it may be that this post inspires other posts about specific bullet points. If you didn't get through all of them, here are the ideas, boiled way down: build confidence, value voice, and balance the need to teach with the capacity to learn. One good element of the conversation led to another good element of the conversation and we got to talking about the importance of relationships. My daughters' high school has been dealing with significant change and consequent stress this year. Moving in the direction of mastery-based grading, teachers and administrators have run into serious opposition from stakeholders--parents, students, and even many teachers do not understand the philosophy and rationale for mastery-based grading. The disagreements have led to negativity and divisiveness. Even though a core belief is that relationships matter, relationships haven't mattered this year, at least not as much as they could or should. During times of stress, sometimes we lose focus of what matters most. Chris Lehman's words have resonated with me since his beautiful presentation during a Wonderopolis breakfast at NCTE14. "Help all the children learn what they really need to know," he began by saying. He then challenged us to think of a child who is in our heart right now. Who does that child live with? What does where they live look like? What does his family care about right now? When people talk about that child, what are they most proud of? His point was that most of the time, we don't know the answers to these questions. Re-reading and reflecting on my notes from Chris's presentation, combined with my thoughts about my daughters and my conversation with their guidance counselor, I'm asking myself some questions, thinking about some of the students I work with when I am in classrooms. When was the last time that I asked a student what s/he did over the weekend and listened to the answer? Do I know what the quietest student I've been working with does after school? Aside from academics, have I paid any attention to what these students' goals are and what they are doing to achieve those goals? I'm not talking about the students who are loud and proud about their achievements...I'm talking about the quieter ones. Tonight, my answers to these questions don't make me proud. Tomorrow, I will work on it. I know that instruction matters. And assessments matter. Results matter, too. 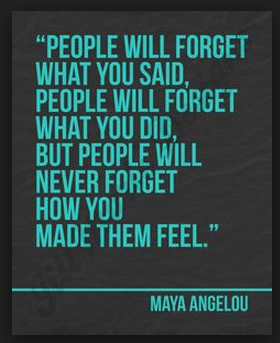 But, at the heart--at the core where it matters most--students will remember how we made them feel. They will remember that we asked questions that weren't on the tests, and we listened to the answers. And we cared. Their favorite teachers will be the ones who talked to them. Really talked to them. 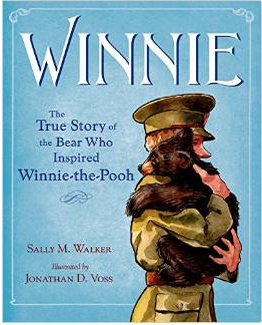 I didn't read many books over the week, but the one that I'm sharing, Winnie: The True Story of the Bear Who Inspired Winnie-the-Pooh by Sally Walker, is wonderful. Who knew that there was actually a real bear who inspired A.A. Milne? This is a wonderful story of a veterinarian who bought a bear cub in a train station and raised the cub. Not only is it a fabulous mentor text for narrative nonfiction, it is also a story that children (and adults) will love! 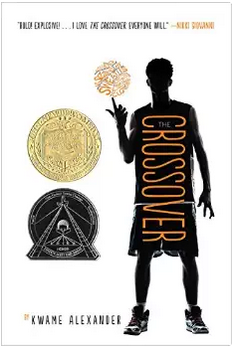 Last week, I wrote about The Crossover by Kwame Alexander. Over the last few days, I read this out loud to my seventh-grade daughter who doesn't really like reading. (Yes, I just wrote that. :( ) Not only did she beg me to keep going, she finished it without me. She came downstairs all teary and set the book down on the kitchen counter while I was making dinner. "This is too sad," she said. We had a great conversation about the power of books and of writing. I have to say, I enjoyed this book even more out loud than I did when I read it to myself. The other significant reading I have been doing is at Two Writing Teachers. Many of you are familiar with the Slice of Life Challenge where we write every day throughout the month of March. Over the weekend, there was a commenting challenge in order to be entered into a drawing to win a Highlights Foundation workshop. What an amazing prize donated by Kent Brown, the Executive Director! I have a love/hate relationship going with the Common Core State Standards, and this relationship is complicated by the SBAC...more on that perhaps next week, when the testing begins. In the meantime, one of the aspects of the CCSS that I appreciate is the fact that I see absolutely no way for students to meet the standards at any grade level unless they are transferring what they know and are able to do across units. Therefore, some of my coaching work has centered on working with teachers to create visible learning pathways for students to see how what they already know helps them learn what they need to know. We filled this chart out as an inquiry lesson, so the students' names are after their contribution to the chart. They were thrilled to see that they already knew so much about opinion writing before they even started. In the couple of weeks they have been in the opinion unit, their writing has been strong. Their classroom teacher and I agree that part of the reason for their success has been the confidence gained from this chart. 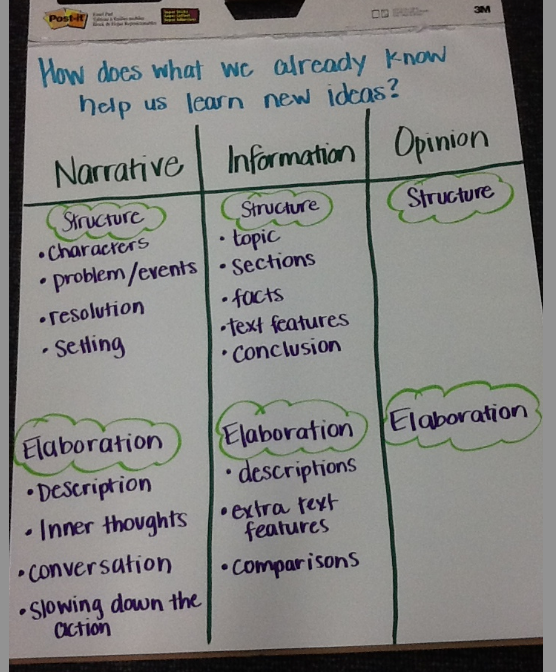 I created a similar chart for a fourth-grade class as they headed into an opinion unit, adding a column for narrative and creating categories for structure and elaboration. The class generated the features of opinion on the first day of the unit and will continue to add to this chart throughout the unit. Again, there is something very reassuring about using what you know in order to learn new information, no matter what you are doing! Slice #18 of 31- Is It All About the GPA? Every three years, our district has a town-wide orchestra festival where students from all grades, 3-12, play together in the gymnasium. Because I only videoed, and I did not take pictures, I am gong to "write without sight" (thank you, Dana Murphy. If you missed this post, I highly recommend reading it!). Picture this. Five orchestras sitting in folding chairs where the basketball teams usually play. At center court and spreading out is the high school orchestra, all students dressed in white and black, playing the violins, violas, cellos, and basses. A few drums are on the back sideline. To the left and in front are three elementary orchestras, each with about fifty musicians, and to the right is the middle school orchestra. Every student is in white and black. Only one of the music directors varies from the black and white with the splash of green from his St Patrick Day's vest, cumberbund, and bow tie. The bleachers are packed with parents cameras, and video devices. Listening to the progression of the orchestras is impressive, but the highlight is when all of the orchestras play together. Tonight, after This Land is Your Land, they played Oh Beautiful as the Color Guard surprised us, marching in with flags and full uniform. Add some tears to the parents, cameras and video devices. But here's the rub. Both my daughters are planning to quit this year. Clare plays the cello beautifully, and is in the high level orchestra as a sophomore. Cecily plays violin and struggles through it, but has worked hard to stay with the program for almost six years. "Are you sure that you really want to quit?" I asked, as we sat in the parking lot. "It's so beautiful." I seized the opportunity. Maybe she's changing her mind. Maybe she'll keep playing. She loves music--plays the piano, sings, is learning the guitar. "It brings down my GPA," she said. In the gridlock of the parking lot, I thought about this sentence and the thinking behind it. What if she could take orchestra pass/fail? What if it wasn't graded? What if her teacher knew that the grading policies and the emphasis on assessment was pushing her to quit making beautiful music? And then, some bigger questions. What is the purpose of grading? When we teach optional courses, like art and music, what happens when the grades are low? Will we weed out the kids who aren't musical? Will we drive out the kids who love music, but won't be music majors? And, what do we want to have happen? If we grade hard, will it lift the level of the work? And what do we really want kids to get out of a music program? And maybe, even bigger questions... Why does my daughter care more about her GPA than about doing something she enjoys? And should she? Frank Bruni wrote a wonderful piece in Sunday's New York Times about college admissions. One of my take-aways was to help my girls see that there are many colleges and universities that offer pathways to happy, productive lives, but wow, in the part of the pathway that goes through high school, the GPA pressures are intense. I'm keeping my fingers crossed that Clare changes her mind, and I watch her perform for two more years. Slice #17 of 31- My Mother's Boombox...It's Tough to Change! We have all tried to explain different ways of playing music in the kitchen to my mother. We have gotten her the Pandora app. We have put music on her phone. We have hooked her up to a Bluetooth speaker system. However, in a moment of panic and frustration, when her music wouldn't play, she went and bought herself a boombox yesterday. "What is that?" my twelve year-old asked. "Does it have a tape cassette deck, as well?" I asked. My daughters missed the reference since they don't remember tapes, but my mother understood my teasing. "I just want my CDs. They're comfortable, and I know how to use them," she said. "They work." I understand her discomfort and I appreciate her resolution. I know many teachers who experience the frustration and incompetent feelings in their classrooms. We have so many new initiatives in our schools. New curriculum. New technology. New assessments. she is intelligent (one of the smartest people I know, actually). she is motivated (she really wanted to listen to music). she has time (I'm never sure of how exactly she spends her days). she understands the purpose of the new technology. But despite all that, she chose to give up, and go back to her old way. Hmmm. 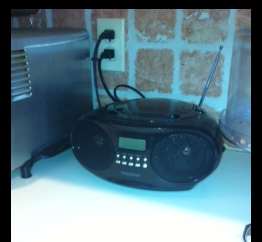 My mother's boombox, as it sits on that counter, is a great reminder to me of how hard change can be. Warning: This could be an expensive post to read. I read some really good books this week. 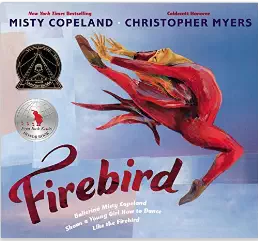 I picked up Firebird by Misty Copeland because I loved the pictures on the cover. I also loved the message contained in this book about perseverance, goal-setting, hard work, and possibility. It is a wonderful title for a classroom collection about growth mindset. It is also a wonderful book for teaching figurative language, as it is full of metaphors and similes. 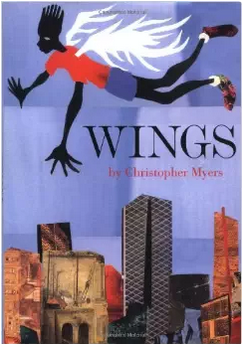 Speaking of metaphors, Wings by Christopher Myers is perhaps the consummate book for teaching metaphors. If you haven't read this incredible book, find it. (Linda, do I have you to thank for the recommendation?) For me, Wings has it all. A powerful message about acceptance, social responsibility, the power of educators to help and hurt, as well as powerful language structures and gorgeous pictures. Some books humble me as an aspiring author. This is one of them. 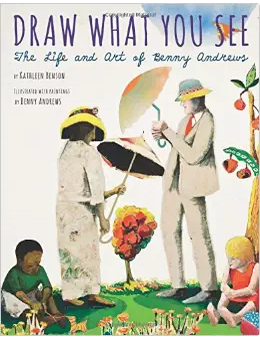 Draw What You See by Kathleen Benson is a biographical account of Benny Andrew, an African American painter. Readers will be inspired to read more about Benny Andrews, who illustrates this picture book. Every picture will inspire a conversation about the historical experiences of minorities, the power of art, and the techniques of artists. You can also find wonderful interviews about his work on youtube. Additionally, it is another wonderful title to add to a collection of books that emphasize and celebrate perseverance, growth mindset, and following your dreams. I don't think there's enough to say about The Crossover by Kwame Alexander. I. love. this. book. I sat down and read it in one sitting on Saturday morning. Then, I started reading it out loud to my husband and 16 year-old daughter. The power of this book to hook them in with the song, the voice, the plot, and the issues is testimony in and of itself. They laughed, but then I watched them experiences the anger that I had as well, as events unfold. This is a truly incredible book on many levels. I can't wait for more people to read it. Last week, I had a conversation with one of the teachers I've been working with. She has been asking me to work as much with the strong writers in her room as the struggling ones, and she has some students who have taken off as writers this year. 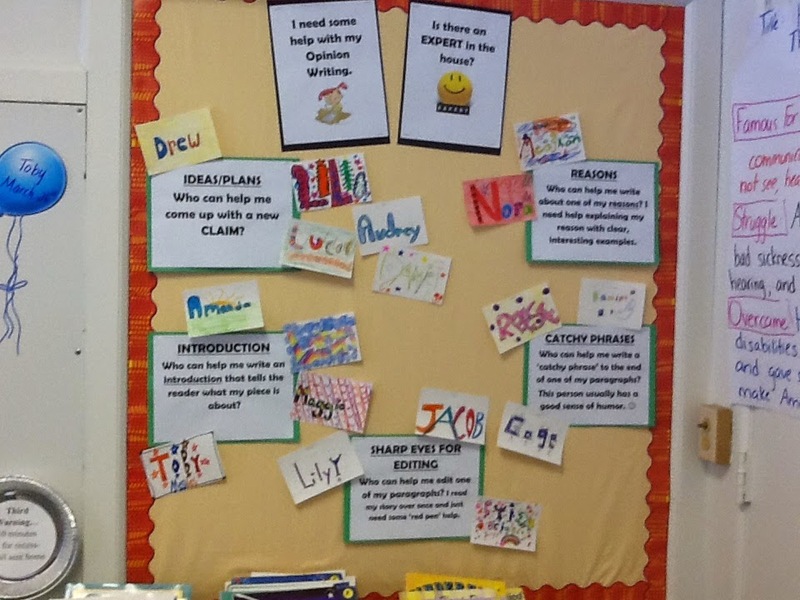 We have done a lot of goal-setting with students in her class, so they are familiar with the idea of working on specific strategies. 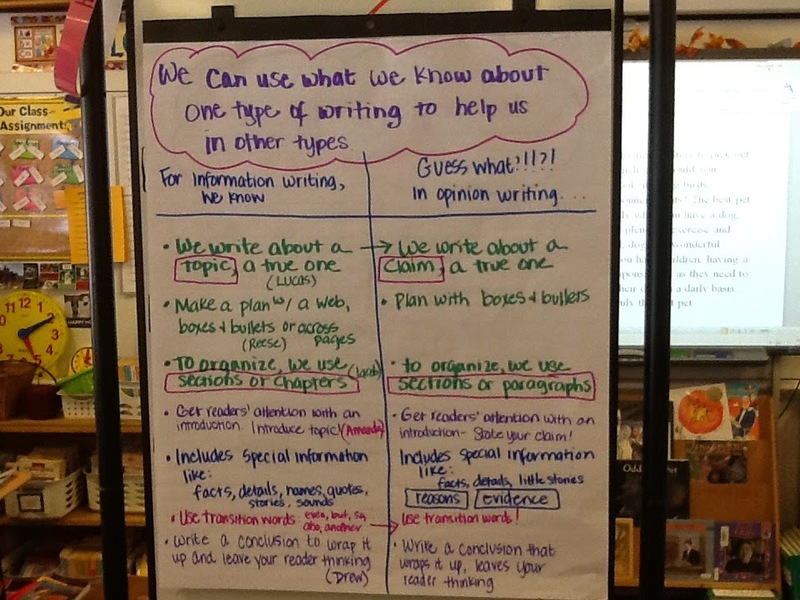 "What if you allowed some students to be the experts on specific aspects of opinion writing?" I asked her. I sketched out what a chart could look like, with students possibly signing up as "experts" on a strategy. This particular teacher always takes my sketches and makes them look way better than my scrawl. I have a new favorite wall. 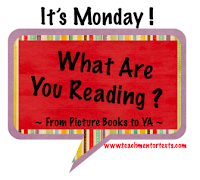 It's Monday--Here's What I'm Reading!